Tom Draus and Susan Fetter experienced the usual dilemma of students enrolled in Florida Master Naturalist Program (FMNP) classes: What would be their required project? Both were enrolled in the FMNP Coastal Naturalist class at the Marine Discovery Center (MDC) in New Smyrna Beach during autumn 2014. Draus and Fetter sat beside each other in the class and many days, they could hear ospreys outside the classroom. Fetter suggested they team up and build an osprey-nesting platform as a joint project. As the two researched their intended project, they learned it would take more time and materials than they had before the class ended to build the nesting platform. At the end of the six-week course, they gave their presentation on ospreys, along with information about a plan to build an actual nesting platform on the back property bordering estuarine water at the Marine Discovery Center. By mid-January 2015, Fetter got the ball rolling again. She viewed osprey and eagle nests on webcams and learned about grants for webcams through the Hancock Wildlife Foundation. She also researched the price for materials. The two quickly decided $3,000 to build a platform was cost-prohibitive. Instead, Draus knew he would build what he could and Fetter would reach out for help from others for the additional building materials. Fetter contacted Chad Truxall, executive director at the Marine Discovery Center and teacher of her coastal class, for help with the City of New Smyrna Beach, along with the local utilities commission. The idea was to get the city and the local power company to donate a pole and labor for the nesting platform. Old utility poles typically cost around $400, with another $1,000 to get a pole installed, noted Fetter. 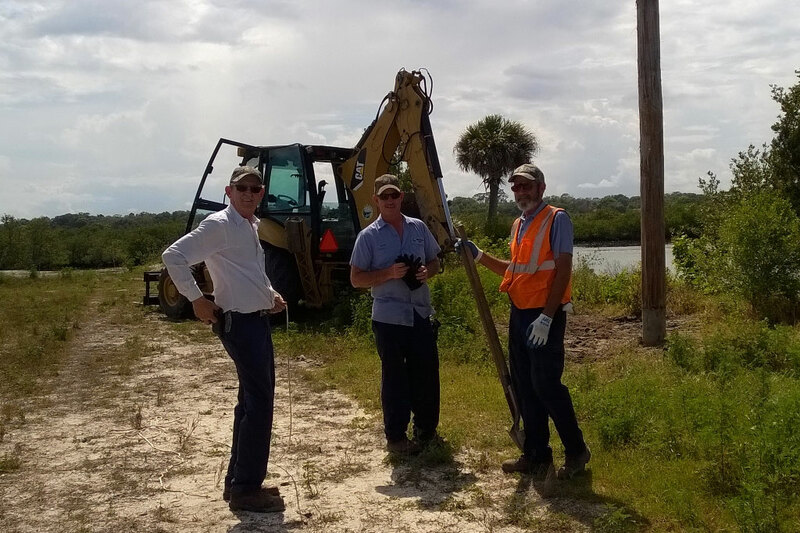 By working through Truxall and his connections with the City of New Smyrna Beach, the students were relieved the pole for their osprey nest would be free – they just had to wait for one to become available. Draus went to work on the platform, using pressure-treated wood to build a 40 x 40 square-inch nesting area with two perches. For the bottom part of the nest, he was able to obtain a vinyl-coated square of chain-link fence from a local business, which he secured with heavy-duty support straps. Draus had the 60-pound nesting platform built by February 5. The students met with the city’s utilities commission in early March, and on April 2, a 40-foot pole was dropped off at the Marine Discovery Center. Draus and Fetter had two more things to do before the platform was raised. They placed nesting materials on the platform, inserting “starter” moss and sticks into the fence on the bottom of the nesting area. They also added an aluminum band around the pole about two feet below the nesting platform to serve as a deterrent to raccoons. 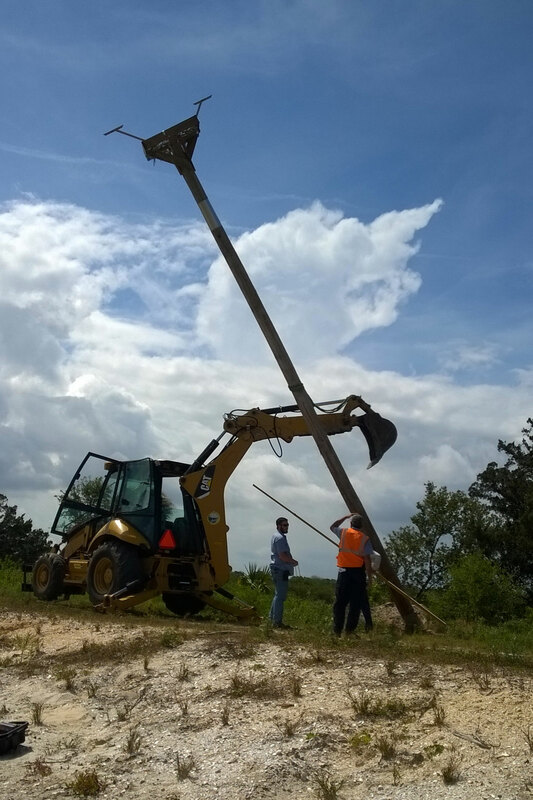 Finally, after months of planning and networking with others who could help them, Draus and Fetter watched on April 7, as a New Smyrna Beach city truck and backhoe lifted the pole with its attached osprey nesting platform and positioned it into the ground. Following one hour of installation, the osprey-nesting platform was in place. As for Draus, he couldn’t help but compare the osprey nest project to his past professional life at Kennedy Space Center.